These Farm Heroes level 560 cheats and tips will help you beat level 560 of Farm Heroes. 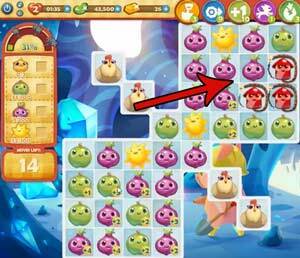 The objective of Farm Heroes level 560 is to collect 2 chicks, 100 apples, 100 onions, and 100 suns in 18 moves. 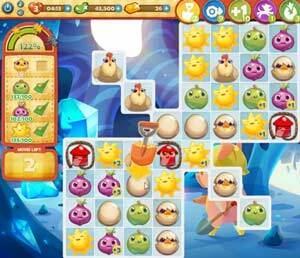 You need multiple chicks to pass this level, so those should be at the top of your to-do list. All the chickens are isolated, and you won’t get any eggs without them. Use the firecrackers provided to blast the chickens out of their little squares. You might need to use all of them to get all the chicken. Now that the chickens are exposed, make as many eggs as possible by matching next to them. 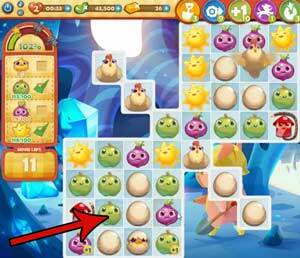 This is the best way to make cracked eggs and chicks–by flooding the board with so many eggs, they’ll match with one another automatically. Even if you get a ton of eggs from your chickens, they might not all end up next to one another. That’s when you pull out the magic shovel. Use the shovels to drop eggs close to one another, or to crack eggs that are next to previously cracked eggs so you can easily create a chick.